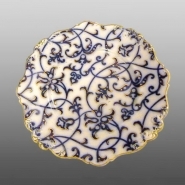 The same pattern, Royal Lily, is seen here on a molded and gilded dessert plate. 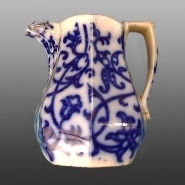 Shown here is a small jug in the same pattern which is marked with the pattern name Royal Lily, included above as an additional mark. Until this marked example was discovered, the pattern had always been known as Bluebell. A large earthenware syrup pitcher printed in flow blue in the Royal Lily pattern with gilding. The handle was painted in a light blue ground and has molded terminals consisting of clusters of grapes and leaves. Metal lid with handle. Two additional examples of this pattern are shown below. The name "Opaque Granite China" is included in the mark and refers to the body itself. The pattern number, 1969, has been painted next to the impressed mark.